Hard Not to Like has done it again! 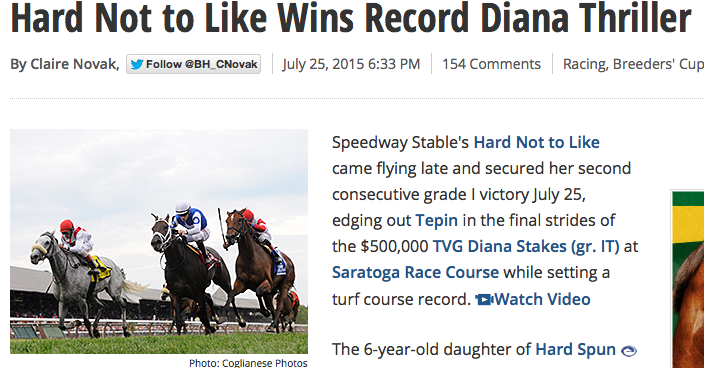 A little over five weeks since winning the Grade I Gamely Stakes at Santa Anita, Hard Not to Like claims the $500,000 Grade I Diana Stakes at Saratoga in course record time – her third victory at the top level. A $1.5 million purchase at Keeneland’s 2014 November Breeding Stock Sale, this talented daughter of Hard Spun is going great-guns in recouping that outlay. Purchased by Speedway Stables on the recommendation of Marette Farrell and John Adger, Hard Not to Like is proving very well named indeed!